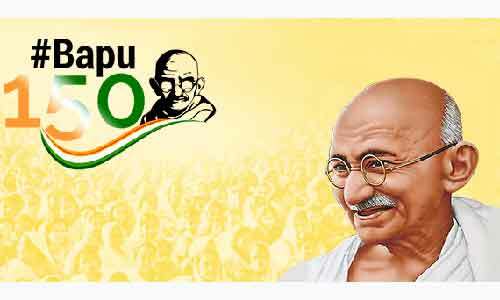 150th Birth Anniversary of a great Soul, the father of Nation, popularly known as “Bapu” is falling today ie 2nd October 2018. Isn’t it a GREAT DAY? And it deserves great celebrations too. Once again we will see Bapu back in all the Indian Schools whether on Indian soil or foreign land. Many children will dress themselves as Bapu and will even walk with a stick in their hands with few followers chanting some slogans or Bhajans (Ishwar Allah Tero Naam, Sabko Sammati De Bhagwan) for the well being of Indian People and for the Nation and for the world. Bulletin Boards will be full of his pictures, his biography, his work and all. And then comes 3rd October, all will forget that great soul for another year (Everything will disappear) ….. This has been going on since Bapu was forced to leave us by some fanatic. Are Schools even trying to teach some of his principles and thoughts on Peace, love, harmony, truth, honesty, Integrity, self belief, respect for all and of course Non Violence. His life story itself is a wonderful lesson for all of us as it has proven that it’s possible to remain gentle in spirit, yet simultaneously command a huge amount of strength and respect. He said, “In a gentle way, you can shake the world.” And there is no doubt about it. In a world in which authority is valued over authentic leadership, I believe we have a lot to learn from the man who fought for our nation with his mind alone. His philosophy was not purely based on theory; instead he lived by rules of pragmatism. He practiced what he preached every day of his life. What an inspiring, authentic way to live! If we really want to pay real Tribute to that “Mahatma” who we address as “Bapu” we should bring him back to school every day and not only once a Year. His Principles, his values should be part and parcel of our school’s day today activities, curricular or co-curricular. I do remember watching a play written by Urdu writer Khwaja Ahmed Abbas titled “Letters from Children to Mahatma Gandhi” based on five children deciding to write a letter to Mahatma Gandhi in heaven requesting him to return back to this world. They also promised him in the letter that they would never play the game which he asked them not to play. Bapu had such an influence that he was being missed by one and all. Here I would not talk about his birth and his work as there is not a single soul in India who does not know that. We all know and even a lot will be written today … but all Bla bla bla only for today….and then forgotten for a year. The most important is Self belief: Your belief in yourself is a determining factor in your success. Believe in what you do and never change your mind even if no one stands by you. There are myriad options available and so many people to disillusion you in today’s times that never let that faith in yourself die. That’s the only thing you need to achieve your dreams and pull you together when times are tough. Then comes Integrity: The quality of being honest and having strong moral principles. There come many attractive options that will lure you away but never do things that you will not be proud of or regret later. Integrity comes from a congruence between thoughts, feelings, words, and actions-when all that you are and do spring from your core values. Gandhiji was one of the greatest examples of integrity we have seen in modern times, and the many moving stories about his life demonstrate the power of teaching this character trait by example. Here is one such story: A mother once brought her child to him, asking him to tell the young boy not to eat sugar, because it was not good for his diet or his developing teeth. Gandhi replied, "I cannot tell him that. But you may bring him back in a month." The mother was angry as Gandhi moved on, brushing her aside. She had traveled some distance, and had expected the mighty leader to support her parenting. She had little recourse, so she left for her home. One month later she returned, not knowing what to expect. The great Gandhi took the small child's hands into his own, knelt before him, and tenderly communicated, "Do not eat sugar, my child. It is not good for you." Then he embraced him and returned the boy to his mother. The mother, grateful but perplexed, queried, "Why didn't you say that a month ago?" "Well," said Gandhi, "a month ago, I was still eating sugar." What power in example! Next is leadership: He was by far one of the strongest and most powerful leaders the country has seen. So needed in today’s corporate, social and political environment. Leader with a single vision. Hesaid, “First they ignore you, then they laugh at you, then they fight you, then you win.” That is the sign of a great leader. And the best is Simplicity & Humility: He won hearts and followers by his simplicity. No show sha, no glamour, no money play just mutual respect. Humility is the act of being modest, reverential, politely submissive. It is the opposite of aggression, arrogance, pride and vanity. And on the surface it appears to empty its holder of all powers. In spite of being in a position of power he was humble and kind. He is the best example of simplicity and humility. On second thoughts I think in the generation to come the Gandhi principles will be more relevant and like Munnabhai says Gandhigiri will be more relevant. Non Violence of course goes without saying that is not only to be preached but practiced too. What should be our action plan? Let us observe different days throughout the year based on values taught by Mahatma Gandhi ji and not only on 2nd October. We can observe Honesty Day, Truth Day, Peace Day, Help Day, respect day etc we should put all these days in school Calendar of activities. Let them be part of school life.Co curricular activities can be designed in such a way that inculcates Gandhiji’s ideas and philosophy. Speech competitions and debates can be organized based on his popular sayings. Nukkad Nataks can be staged frequently during regular break times in schools. We can have fancy dress or mono acting competitions for junior students based on his philosophy and his life. There are so many activities that can be organized round the year like Exhibition on art and craft, Creative writing competitions based on Gandhi ji’s philosophy. Essay writing, poetry writing etc can also be promoted among students. Gandhiji firmly believed in the religion of HUMANITY. He said the essence of all religions is one, only approaches are different. We have to groom our children to be responsible citizen of the world where they understand the meaning of co-existence with all the diversities. Schools have tremendous responsibility of bringing Gandhi back to Schools . If they succeed in doing so they will be fulfilling their responsibility towards creating a better world with PEACE AND HARMONY which Gandhiji had dreamed of. The schools can surely make all the difference. Let me conclude, sorry not conclude let it be the beginning with the popular saying of Mahatma Gandhi “BE THE CHANGE YOU WANT TO SEE IN THE WORLD.” Let us be that change.